Studio Wildcard confirmed today that the island of ARK: Survival Evolved will open its gates Tuesday, June 2, onto Steam’s Early Access, merely three weeks after announcement of the game. The veteran team at Studio Wildcard is working fervently to make the immersive open-world dinosaur survival game that has been dreamed of for so long by so many gamers. Will you join us on ARK? Powered by Unreal Engine 4, ARK: Survival Evolved takes on the survival genre with a unique blend of emergent multiplayer cooperation and competition. Players awake naked and starving on the beach of a mysterious island called ARK among a herd of other confused humans. They must then hunt, harvest, craft, research technology, and build shelters to protect against scorching days, freezing nights, volatile weather systems, dangerous wildlife, and potential enemies. Tame and ride one of 70-plus amazing dinosaurs and other prehistoric beasts, including gargantuan creatures on a scale never before seen in video games! Fly a Pterodactyl squadron over snow-capped mountains, race through the deep jungle with your pack of trained Raptors, tromp through a fortified enemy base along a convoy of gigantic Brontosaurus, or chase down prey on the back of a raging T-Rex. 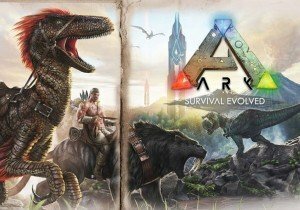 ARK: Survival Evolved will launch in 2016 on PlayStation®4 with Project Morpheus support, Xbox One via the ID@Xbox program, and Steam, including Oculus Rift VR support and a thorough integration of Steam community features such as Steam Economy and Steam Workshop for custom maps and mods. Players will also be able to host private/LAN servers, and have access to a custom-built version of the Unreal 4 Editor for creating mods. The world of ARK is designed to be player-oriented and ever-expanding!